United Charters provides some of the finest coastal and marsh fishing charters to be found in the unspoiled waters of Shell Beach, Louisiana. We are USCG licensed and insured. Through our commitment, experience, and expertise United Charters has established a business relationship with our customers that will last a lifetime! Today I had Mark Deckard and his friends Stan and Alex join me for a cool fishing adventure. We loaded up with live shrimp from Campo's at 9:00am and headed to Bayou Robin to probe the deep holes. We tried several spots in the area and could not find any fish except 1 Goathead. Next we ran to Four Horse Lake and it was on. The guys started pulling Trout after Trout in to the boat. We fished with live shrimp 2' under a cork, and also with the Speculizer. The guys had to call it quits early and we had to leave the fish biting so they could make it back in time. Our final count was 76 Trout and 4 Goatheads along with lots of throwbacks. We all had a great time and look forward to the next time. Call United Charters for you next fishing adventure. (504)-439-1680 United we stand and United we fish. Some times I am a Trout Fisherman and some times I am a Goat Herder. Today I was a Goat Herder. Today JC and Denise joined me on a break in the motor trip. With the warm temps and flat seas and a need to put some running time on the motor, we headed out in to Breton Sound in search of something to give our tackle a test. Armed with fresh shrimp we proceeded to fill the boat with meat. We caught 40 of the biggest Goatheads you would want to see, along with 6 Drum, 12 Channel Mullets, and 5 big Trout. All fish were caught in 15- 20 feet of water with dead shrimp on the bottom. Say what you want about a Goathead, but they are my favorite fish. They put up a good fight, and the meat will put a Trout to shame. United we stand and United we fish. Some times I am a Trout Fisherman and some times I am a Goat Herder. Today I was a Goat Herder. Today JC and Dennis joined me on a break in the motor trip. With the warm temps and flat seas and a need to put some running time on the motor, we headed out in to Breton Sound in search of something to give our tackle a test. Armed with fresh shrimp we proceeded to fill the boat with meat. We caught 40 of the biggest Goatheads you would want to see, along with 6 Drum, 12 Channel Mullets, and 5 big Trout. All fish were caught in 15- 20 feet of water with dead shrimp on the bottom. Say what you want about a Goathead, but they are my favorite fish. They put up a good fight, and the meat will put a Trout to shame. Reds, Heads, and Drum, that was what was on the menu yesterday. Tuesday I took Joseph Williams and David Pennington on a Goat herding trip to Breton Sound. With the Trout bite so fickle, and the gnat bite on so strong in the marsh we took advantage of the low winds and made our way out into Breton Sound for a meat haul with some big hard fighting fish. The guys filled up the fish box with limits of big Reds, and a load of Drum, and Goatheads along with lots of Channel Mullets. All fish were caught with dead shrimp on the bottom. The guys keep me busy all day long retying hooks and leaders. These big fish are right up under the rigs, and do not like to come out with out a fight. We had 2 fish come up with some one elses hooks and leaders hanging out of their mouths. I had a great time as usual with these guys as they are non stop fun to be around, and I look forward to their next trip. Yesterday I helped Frank Moore Fishing with the King on a large group from IMC Consulting. In my boat I had Chip Higbee, Clay Schweizer, and Russ Hoppes. The forecast was for high winds and rain, but thankfully the weather man did as usual and blew it. The morning had a gentle NW wind and clear skies so off into the Sound we went to avoid the gnats and little fish in the marsh. We fished a few well heads with dead shrimp on the bottom and we ended up with a huge load of fish in the box. The guys had a good time while catching 36 Goatheads, 3 Reds, 10 Channel Mullets, 2 Trout, and at least 18 unidentified unmovable bottom objects. They enjoyed some of the Kings famous fried fish while their catch was being cleaned. Thanks Frank and the IMC group for a great trip. Lots of big hard fighting fish at the Beach today. Today I had John Fenasci and his buddy Sam join me for a good as it gets day of fishing in Breton Sound. After getting bait and gas at Campos we made the run to where the big fish live. The weather was perfect, and the water like glass, but it was still dirty from all the West wind the day before. As we got further into Breton Sound the water looked better, and got better as the day went on. It was non stop action from the time the first shrimp hit the bottom. The Reds were there and hungry, and they were not alone. The Drum and Goatheads pounced on anything that got passed the Reds. 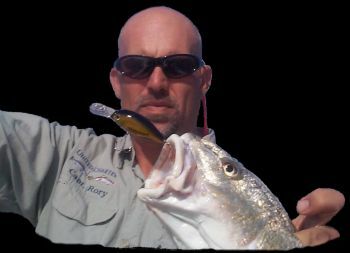 The guys had a great time catching limits of both Reds and Drum, and over 30 Goatheads. They went home with 16 bags of some of the finest eating fish that we are blessed to have in our waters. Where is the media coverage on the LNG issue? Where is the media coverage on the LNG issue? Those of us that use this and other internet sites are aware and educated, but the average man on the street has no idea of our plight. Has anyone seen or heard anything about this on the news, or on the radio? We need to get this word out to the media and get our voice to the general public. It is obvious that our governor and the local media are being controlled by big oil. Please write your local TV stations and newspapers demanding coverage of this issue and call talk radio shows and be heard. United we stand and United we fish, but with open loop we will be only standing.